Sensors are necessary to detect the components of the air. These are used e.g. in smoke detectors. However, instructions for using these gas sensors at the Raspberry Pi are rare, which is why in this tutorial the general use of such MQ modules at the Raspberry Pi is shown. Thus, e.g. smoke detectors or air quality testers can be built. 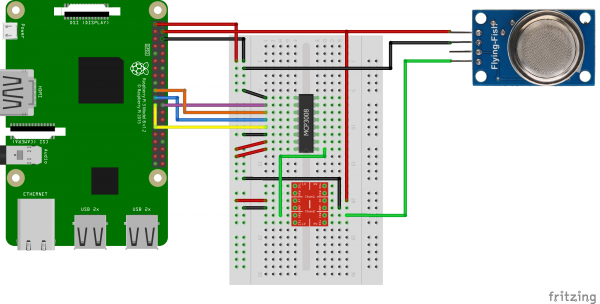 How to configure any MQ sensor and read it out with the Pi will be shown on the example of the Raspberry Pi gas sensor MQ2 in this tutorial. All other sensors (MQ3, MQ-135, etc.) can also be adapted with a few additional steps. All MQ-X sensors return analogue signals, which we can not easily read at the Raspberry Pi. One possibility would be to use an Arduino, but we can also use an analog-to-digital converter (ADC), which can be read out via the I2C bus. In addition, we also need a logic level converter. You can find the full list with additional information here. I recommend to use a sensor with a soldered PCB, because no further cabling and the use of resistors and capacitors is necessary. Details on the individual Raspberry Pi gas sensors can also be found in the corresponding data sheets. Simply google the name of the sensor including “datasheet”. There is also the voltage at which the sensor operates mentioned. If someone wants to build an alcohol tester or something similar, you should also be aware that these modules are not absolutely accurate and can not compete with a professional measurement. In this example, we use a 5V voltage as output. This is too much for the GPIOs, which is why we use a logic level converter (TTL) that cuts down the voltage. If you use a sensor other than the MQ-2 and it has a different voltage, the setup must of course be adjusted. After the MCP3008 is correctly connected, we use port 0 and connect it to RX0 of the TTL. On the opposite side is RX1, which is connected to the analog pin (A0) of the MQ2 sensor. Also connect 3.3V from the Raspberry Pi (LV) and 5V (HV) to the TTL. And also 5V to the VCC pin of the gas sensor and GND from the Raspberry Pi comes to GND on the LV and HV side of the TTL, as well as to GND of the MQ2. I use the 5V of the Raspberry Pi’s. However, an external power supply is recommended if other sensors and modules or input devices (keyboard, mouse, touchscreen) are used. For this, the sensor is simply supplied with current from the external source (HV side of the TTL) and the ground connection (Minus / GND) is connected to GND of the Raspberry Pi. The specified values are in logarithmic scale. However, the scaling of the values is not linear but logarithmic to the base 10 (log). so, the first stroke on the X axis is 200, then 300, etc. The first stroke after 1000 is 2000, etc. The distance between is linear. The idea behind this script for calibration and reading is to create a straight line and calculate the amount of gas (in ppm). To do this, we need two points to calculate the slope. Let us take the example of LPG. We therefore take the point P1 (x = 200, y = ~ 1.62) and P2 (x = 10000, y = ~ 0.26). To calculate the “real” values, we apply the ten logarithm. Using the two-point form, we can calculate the slope, which in our case is -0.47 (link to the calculation). With the slope and the calculated logarithm from the left point (x = 2.3, y = 0.21), we can now determine the straight line. For the remaining gases the calculation is equivalent and can be carried out in the same way. Anyone who wants to have more reading material can do this here. Then we change to the directory and run the existing Python test file. The calibration is started automatically during initialization. It is important that the sensor is in good / fresh air as smoke / other gases would falsify the calibration. The process takes a few seconds, but the gas content can already be measured thereafter (see video). Some sensors are quite hot, but this should not be a cause for concern. If you want to use another sensor, you have to adjust the formula, depending on the sensor’s datasheet (cf. my example). Thank you for your work ! Also I have a question. Does the calibration have to be for 48 hours, does the sensor has to be pluged for 48 hours ? And how do you know the value of the load resistance ? usually the calibration needs about 10 seconds (enough precision for my applications). The value was given (you can change it, depending on your sensor). Thank you for your response 🙂 ! Can I also get for mq 135? i am not using mcp. i have directly connected the sensor to board without any converter.what kind of changes I have to do in code? It is not possible. You will need an ADC, as the Raspberry Pi cannot read analogue inputs. i need help i am not using mcp. i have directly connected the sensor to board without any converter.what kind of changes I have to do in code? If more than 3.3V are connected to the GPIOs, you can break them. Hello, im using mcp3002 instead mcp3008. What change should I made? always show “Abort by user”, i’ll tried wiring like this tutorial and use code same on this. anyone can help? how to log the exception? my return result is only one value for ex. 0.095875. Can you help me get those 4 values like yourself in the video (Ro, LPG, CO, smoke)? i am using mcp3008 with mq2. but i am facing difficulty in wiring as my mcp has only 5 pins. So I am confuse what to do now. With only 5 pins I don’t think it could be a mcp3008. Google ‘mcp3008 datasheet’, and you’ll see that they all have the same layout. There’s a 3004 but even that has more pins than 5. Sorry as I’m new, but I’m unsure of how this could work. Any documentation I can find on a logic level coverter says that they canot be used for analog conversions. They are only on/off. You’d have to take the output from the sensor and divide it using 2 resistors. That’s why we use the MCP3008 Analog Digital Converter. I want to put an active buzzer in the project once the gas quality detected by the sensor get too high. In what part should I put the code for the buzzer? have you a better diagram? mine aborts straight after running it. el conversor de nivel logico lo conectan a la salida de dato analogo o digital? Should be the same, but you have to adjust the formula! i got an error from this line of code can you please help me? Do you have codes please programming my mq 5 gas sensor to python using raspberry pi? Need much help about it. Is anyone experiencing something similar? There is probably some exception thrown. You could log it to find out more. have u solve ur problem? I am also experiencing the same issue. Have you got any solutions?? You can replace it by the other library. Sunny have you fixed it? I am getting the same error. I checked ADS1115 output and it is giving values for all 4 channels. Sample output mentioned here. But when running MQ2 example.py, it is giving same error. Please suggest how to check the signal coming from MQ2 sensor to ADS1115 is Ok. I also have the same problem please assist. HI Felix thanks for your help and support. I.m having this errrr can you please help me..
pi@raspberrypi:~/Desktop/MQ2/Raspberry-Pi-Gas-Sensor-MQ $ sudo python example.pyPress CTRL+C to abort. You have not enabled SPI or not installed SpiDev. thanks to both, I had several problems like not enabling the SPI but it still does not work, I’m trying now the other URL, thank you very much. ADC checked ..can you please confirm used port are 19,21,23 and 24_? 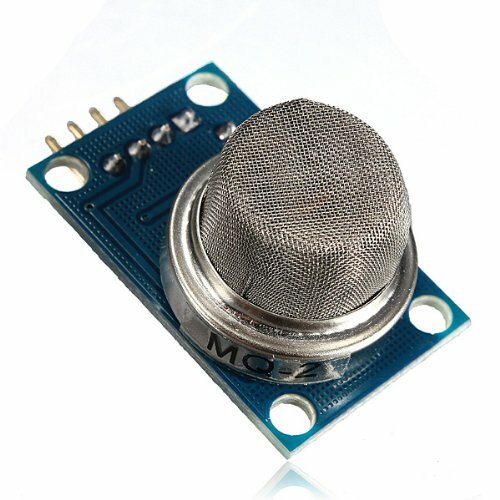 can i connect MQ-5 gas sensor to raspberry pi ? if yes can u pls show me the circuit ? Yes, the circuit is the same (use the analog output pin). when I run the program it is immediately aborting by user after printing calibrating. I have rebuilt the device a few times with different parts to minimize the potential for a broken piece. The errors that keep appearing are blank read adc values, no calibration and spi not available even though SpiDev has been enabled. while trying to run the program in Thonny IDE on the Pi, Errors keep appearing on lines 49,72, and 89. Any help would be greatly appreciated! Turns out I had the ADC chip in backwards. The values are now starting to populate but the program will now randomly exit after only displaying values for a second or two. hello sir, had you got solution for this problem, i am also facing the same problem. could you suggest me sir! Thank you Felix for this awesome tutorial, it helped me a lot! I admire your patience to answer all these Googleable questions. Why don’t you use the digital output from the mq-2 sensor; but use the analog output + ADC? May i know how can you get the value of P1 (x = 200, y = ~ 1.62) —–1.62 from the datasheet? how did you get the 2.3 value ? any one have code mq-135 sensor with pi In python code. mq2 gas sensor can detect acetylene? can you please suggest one to identify it. 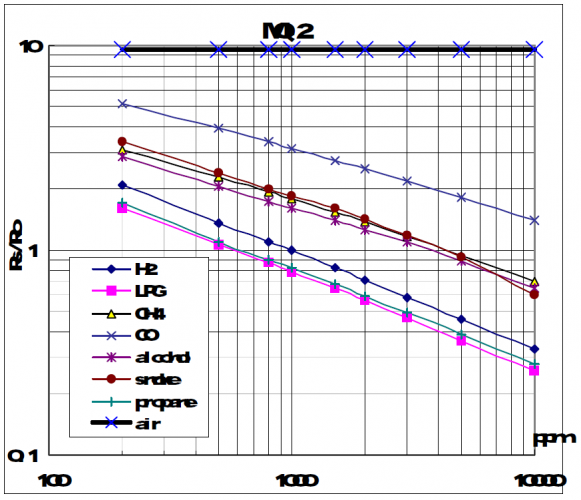 why we used MCP3008? i saw mq-135 sensor have already digital pin why we cannot direct digital pin. That digital pin is not a serial communication pin. On the sensor’s circuit board, there is a potentiometer setting a threshold value. If analog output is above that threshold value, digital output becomes high. If analog output is below that threshold value, digital output becomes low. This feature is for some basic diy circuits. For example, you can connect a LED to digital output pin. (There is a LED on the circuit board already 🙂 ) And you can set the potentiometer to a value that LED does not turns ON, in a clean air. If air goes bad (or whatever you name the situation), LED will turn ON after a gas density, depending your setting on potentiometer. I love this project and i want to make this project. You explain everything in this video but could you please provide me schematic diagram of this project? how do you get (x = 2.3, y = 0.21)? hello sir how will we get the slope for the given x and y? How about gas sensor for ethylene? is there any? My Ro=-0.213053 kohm. What’s wrong? Can you please explain me the code or If I can find the code explanation anywhere? Please help, have already googled everything about spidev. This estimation of Rs/Ro from datasheet come with Big number of Error. If I have a sensehat will I still be able to attach this or will I have to remove the sensehat? Is there some way to extend the pins or something? Channel 0 is connected to RX0. So should we remove that connection? You just need to test the digital value which is generated by the software and hardware both. You can use any of the ADC’s channels. You should connect a line(cable, etc, whatevery you call) to an ADC pin at a time. For your specific question: Yes you should remove that to measure the correct value. Did you find solution for negative Ro? I am having similar results with gases not being detected. I realized that there is a little mistake on the code. In python math.log() takes log on base 2, not on base 10. math.log10() should be used for log based on 10. Therefore the code above should be updated as like the below. I get a list of 0 like[0 0 0]. Due to this I am getting a divided by 0 error. What can I do to resolve it? Could you please check your connections? Do not forget ALL OF THE 8 pins of MCP3008 which are on the opposite side of the channel pins. After being sure of this, check return value again. If the problem still occurs, instead of sensor output, connect 3.3 V to a channel and check the printed value again. “ALL OF THE 8 pins of MCP3008 which are on the opposite side of the channel pins” should be connected. Do not skip any of them. I followed all the steps and when I type sudo python example.py it says abort by user even though I did not abort. How can this be fixed? I am trying to do a project where I am utilizing multiple gas sensors. I know that the MCP3008 can support 8 devices at once, but I have read in forums that the Raspberry Pi can only handle 2 SPI slaves. I have made gas sensors multiple circuits utilizing one MCP3008 and TTL, so will that work? (They are soldered circuits). I have already utilized one of those circuits and that works fine. I have a GPIO expansion board with three GPIO pin headers, so I have 120 pins to utilize, all with the same layout as the normal pin header. If not, could I connect 8 sensors to one MCP3008? And what kind of changes would I need to make to MCP3008? “Abort by user” is being displayed. Anything you can help? I’m trying to understand why logic level converter is needed between ADC (MCP3008) and MQ sensor. there is no need for that and IMHO this comment makes sense.